This volume is a collection of personal correspondence and first-person recollections that focus on Ricardo’s life outside of his political economic endeavors. These missives concern the aspects of Ricardo’s life that surround his character, his amiable and generous nature, his successful business dealings, and his personal relationships. It includes a memoir written by one of his brothers that sheds light about his family, his formative youth, and his education. There are chapters on his entrance into the stock market as a mere teenager and records of his meteoric climb within the financial community to an extremely successful station. 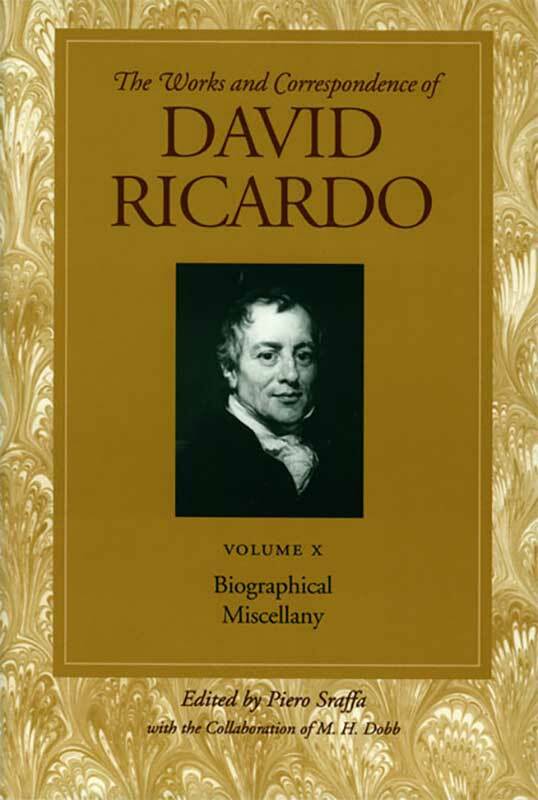 Preface, appendixes, bibliography of Ricardo's works, survey of Ricardo manuscripts, commonplace books, Ricardo's library, index of persons and places in Volume X.